Audi is officially embracing the power of digital! The first brand to have opened a digital showroom in automotive sector and defining the digital car showrooms of the future. Their attempt to revolutionize the shopper marketing arena and making consumers experience the brand digitally in store has called for a big investment in the time of recession today. Even though Audi is doing well in a few markets, it is not really the best time for such a heavy investment. Or may be it is! Trying out a new interactive and exciting way to get people in the store, why not? One reason going around in the press for coming up with such a concept is the complaint regarding the lack of space to accommodate the Audi range under one roof. 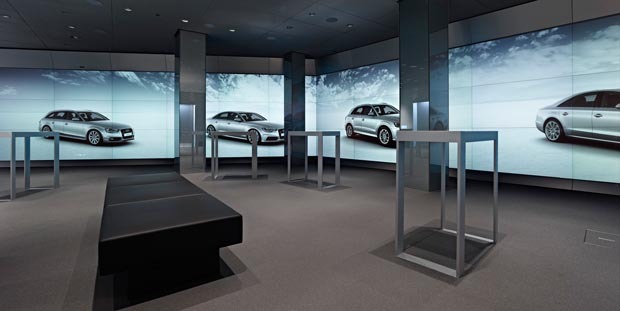 Playing on this, Audi plans to launch 20 more digital showrooms in the coming two to three years time. Huge screens display the cars interior and exterior and also allows customers to listen to the sounds of exhaust and opening and shutting of doors as well. The store also has paint, wood and leather samples which can be viewed and touched in person. Customers can also arrange a test drive at the dealership. Not just that, the huge digital walls are also controlled by tablets on which customers can create a car and view their configuration of the big digital screens. Such a concept hints at the future of retail in markets where space is an issue in areas where customers are present. Opening such showrooms in shopping malls can be a huge success in developing markets like China and India where malls are coming up every other day and there are issues regarding space. Plus, it also allows the brand to test new markets where they don’t want to launch 20 or so dealerships and can just launch such a store and see how the market/region develops for Audi. It also helps to cut down many costs of vehicle maintenance in the showrooms and resourcing. I really like the concept and looking forward to hear more about the results from Audi on sales, customer response and pros and cons for both dealers and customers. Twitter users with American Express card are required to sync their American Express card with their Twitter account to start taking part in the offers. You have to be on the look out for #amex followed by the offer name eg. #amexcoffee #amexbeach and to take part all you have to do is just tweet that offer hashtag and when you swipe your American Express card the offer will be automatically redeemed on your card. Such an idea is tapping the growing mobile payments behavior and giving people serious reasons to use mobile for payments. Why I am mentioning mobile here is because you need a smartphone to use Foursquare, Facebook & Twitter apps to take part in these offers on-the-go with Amex. This saves the headache of printing coupons, remembering codes and saving eCoupons etc. It is seamless and such payments are on their way to becoming a part of daily life for many smartphone users and Amex has certainly made a smart move here to offer benefits to their customers on-the-go! Keio University,Japan are working to bring some serious interactivity in poster ads. Reportedly the developer behind this was frustrated of the standard poster and wanted it to interact with him. He went on to develop one where the girl in the poster interacts when woken up by kissing the poster. It works based on an inbuilt sensor which can sense the users proximity to the poster and acts accordingly. The team in Japan are also working on ways to make it more interactive using sounds and releasing scents via the poster ad like giggling sounds of the girl, the scent of her shampoo, lip gloss lemon-flavour scent upon close-up and even a whisper of “I love you”. They are also looking to develop applications with image-recognition for iPads and tablets. I can only imagine how expensive it will be to produce these poster and the massive installation costs for various regions. I definitely see Coca-Cola and Nike on-board with such a technology but when it comes to this typical example P&G brands can make quite an impression with their already successful products.